This chest of drawer style night stand has four dovetailed drawers for plenty of bedside storage space. This night stand is only 16" deep but measures 32" high. This Shaker furniture is sleek and sturdy with raised panel sides, wooden hardware and drawers that show off the solid wood grain. Choose to have this nightstand made in your choice of Red Oak Wood or Cherry Wood and stained or painted. 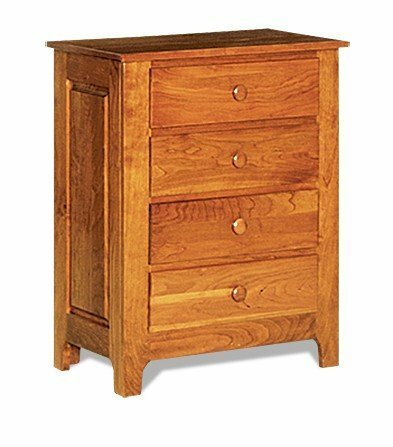 Cherry wood is the most popular choice for our Shaker Furniture. This stand is Amish handcrafted in Lancaster County, PA. If you are looking for other woods besides oak and cherry, please call one of our furniture specialists for a quote. We can also customize this item. This piece takes between 6 to 12 weeks to be custom built for you.